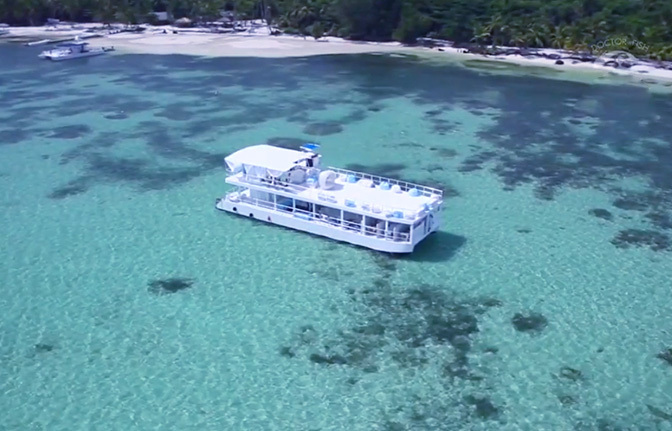 Enjoy a 3 hours excursion that will provide you with extreme relaxation in a very exclusive setting. 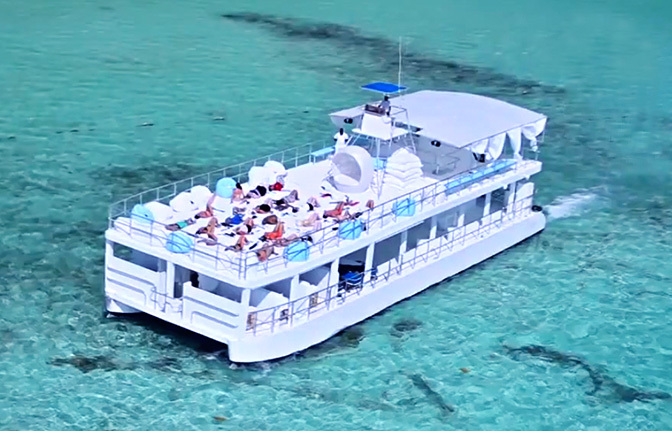 Our double deck boat is designed to be a sailing spa and has restricted capacity in order to provide you with personalized attention. 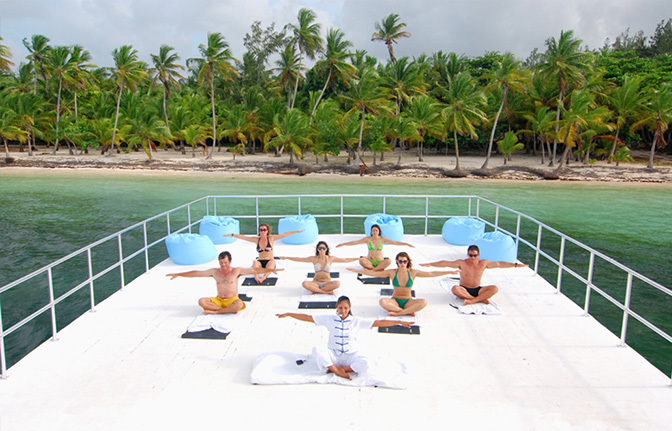 Get involved in bio-pilates exercises while we cruise the calm and colourful waters of Bavaro. Bio-Pilate Class, under the professional guidance of our bio-pilate instructor focuses on several stretching and breathing exercises. This class takes place on the second deck which offers a spectacular view of the Bavaro-Punta Cana coast. You will reach maximum relaxation while participating in our Individual massage treatment. This massage is offered in private cubicles with ocean view, and includes head massage, and full back massage, including foot massage and some stretching. Enjoy a special massage and a relaxation session on our floating mattresses in the natural pool and let us introduce you to our world famous Dr. Fish where you we will treat you with the most amazing Feet Exfoliation treatment. The tiny fish called Garra Rufa will gently exfoliate your feet while you watch in amazement the whole process. The Dr Fish gently exfoliate your feet by removing the dead skin creating the feeling of a gentle massage and leaving your feet rejuvenated and soft to the touch. Dr Fish secrete enzymes called Dithranol which improves skin regeneration. Dithranol is found in creams or products used to help obtain smooth soft skin. Our staff will also prepare you for our Detox foot treatments are a therapy aimed to improve among other things, liver and kidney function through an electromagnetic detoxification process carried out on the feet. The treatment is activated with an array placed in the water. This array causes ionization of the water and allows detoxification through the feet, which are a natural detox output because they have over 200 large pores. During the whole excursion natural juices and fresh fruits will be served, as well as natural herbs infusions. Toward the end of the excursion we will also have sandwiches and salad together with a chilled glass of white wine.